Sudoku puzzles have become pretty popular. I see people working them in airports, on plains, and in waiting rooms. 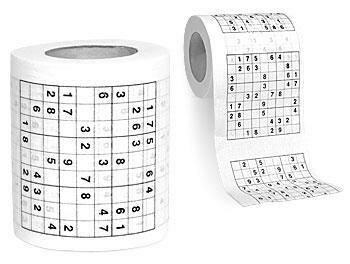 There are pocket sized puzzlebooks, online sites, even handheld electronic sudoku games. You can use these puzzles to sharpen your mind every spare moment of every day, especially since THIS product became availible. The puzles look pretty simple. Which is good, because I'd hate to spend 10 or 20 minutes just to get a square of toilet paper. Best of all, if you get frustrated with a puzzle you can...you get the idea. that is pretty cool because i love Sudoku puzzles. there so addicting i did one and was online trying to find more i love them.